Roswell, GA, March 10, 2011 - GS Yuasa Lithium Power, Inc. announced the release of two new lithium ion battery modules today: the "LIM50E-7G" and the "LIM50E-8G." This new line of battery modules provides a new level of value to customers in need of energy storage solutions that offer high energy density and long service life. LIM50E module applications include utility grid ancillary support, community energy storage, industrial electric vehicles, telecommunications back-up power and others. 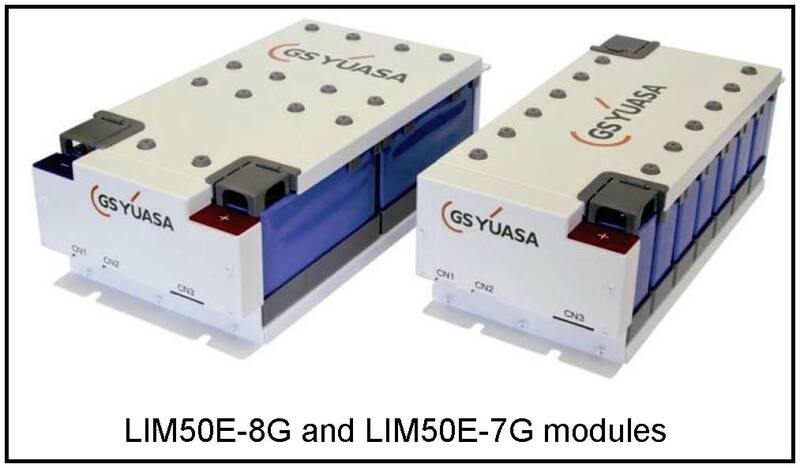 "The addition of the LIM50E modules to our product portfolio brings GS Yuasa's recognized high level of lithium ion battery engineering, quality and performance to batteries targeting the industrial and grid storage market" comments Bill Moll, president of GS Yuasa Lithium Power. "By taking advantage of the automated high rate cell production at GS Yuasa's manufacturing facilities in Japan, we can provide high quality lithium ion battery systems to meet the cost targets and production capacity required by these growing market segments." GS Yuasa Lithium Power (GYLP) is a provider of high-performance energy storage solutions for undersea, aerospace, hybrid and electric vehicle and other applications. GS Yuasa's experience in large format lithium ion cells, batteries and management electronics stretches back to the mid 1990's. To this heritage, GYLP adds domestic battery engineering, design, test and production capabilities in support of North American customers.